As Part of the Traditional Chinese Medicine, Acupuncture is well known for its results in pain management, health maintenance and life cultivation. Pain Management – It has been proven that for muscle skeletal pain, acupuncture can, in majority cases, minimize the chronic or acute pain and improve the range of motion by at least 50% during the first visit, and continue to improve the pain management in 3 to 6 treatments. Acupuncture is also effective in most other pain symptoms, be it headaches, abdominal pain, menstrual pain etc. Prevent diseases – e.g. Cold, Flu, Asthma, fatigue, stress, indigestion, and other yin yang imbalance diseases. Maintain Health – e.g. delay the materialization of pre-diabetic, pre-renal, pre-prostate, pre-menopause, etc. Speed up recovery – e.g. maximize the opportunity of a successful surgery and prevent complication after the surgery, etc. Minimize the negative impacts of the bio-rhythm – e.g. menstruation, menopause, memory deficiency, etc. …for a happier and more enjoyable healthy life. The most common question we get is about the needles we use. Most people have encountered hypodermic needles and sewing needles. Both types are gigantic compared to the ones we use. In fact, five of our needles could easily fit inside a hypodermic needle! 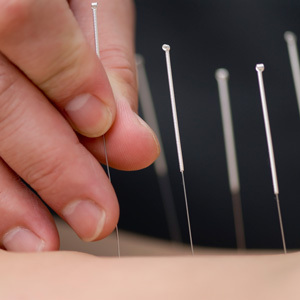 Our acupuncturist uses high quality painless needles, he also matches the use of needles with the treatment requirements and the patients comfort level to minimize any discomfort of the treatment. Needle-less TCM treatment using the same acupuncture principal is also available with equal if not better results when required. When we first insert these ultra-fine, sterile needles at special energy points on your body, most people report a small prick, like a mosquito bite. Acupuncture is generally regarded as very gentle and almost pain free. Your initial acupuncture visit will include an assessment and treatment. Most people experience a variety of post-session feelings, which range from energized emotion to a deep sense of relaxation and well-being. If you are looking for an acupuncturist, Yuchee is your guy. He is attentive, knowledgeable and professional. He will help you with your back or neck problem, plus improve your chi. You will feel more relaxed and energetic. Sonny N.
Fifth Avenue Place Chiropractic & Massage offers exceptional care with personalized treatment to suit your needs. Contact us to Book an appointment today!